Historian at the Kennedy Library from 1977 to 2000, Sheldon M. Stern is the author of "Averting ‘the Final Failure’: John F. Kennedy and the Secret Cuban Missile Crisis Meetings" (2003), "The Week the World Stood Still: Inside the Secret Cuban Missile Crisis" (2005), and “The Cuban Missile Crisis in American Memory: Myths versus Reality,” all in the Stanford University Press Nuclear Age Series. 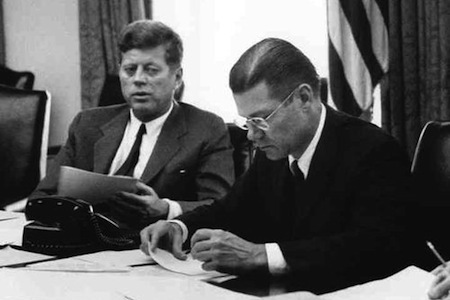 President John F. Kennedy and Secretary of Defense Robert McNamara in an ExComm meeting during the Cuban Missile Crisis, October 1962. Credit: White House. Noam Chomsky’s October 15 TomDispatch article (cross-posted on HNN) on the Cuban missile crisis quotes extensively from my work. Unfortunately, he also distorts the historical record and decontextualizes my conclusions. His insistence that the crisis was actually about U.S. “ownership of the world” tell us little or nothing about how real people behaved in real circumstances in October 1962. JFK and the other missile crisis participants, we should never forget, did not know the outcome of the crisis when they were in the middle of dealing with it. Even if President Kennedy had tried to act for history by being more temperate, how could he have known which position taken during the discussions would ultimately be judged favorably by historians? What if, for example, the Russians had responded to the blockade, just as the Joint Chiefs of Staff (JCS) had warned, by carrying out low-level bombing raids in the southeastern U.S. or by launching the operational nuclear missiles in Cuba at the American mainland? Historians today would still be listening to the same tapes (assuming any tapes or historians had survived), but with a radically different outlook. It would then be the Chiefs who had turned out to be right. In other words, if the outcome had been different, the same tapes could then be interpreted to make Kennedy look appallingly negligent rather than diplomatically cautious and reasonable. ● Professor Chomsky declares that “U.S. destroyers enforcing the quarantine around Cuba were dropping depth charges on Soviet submarines.” In fact, the president specifically rejected the use of depth charges. He was eventually persuaded to use so-called “practice depth charges” only after he was assured that they would not damage the submarines. In fact, they did cause damage and nearly set off a nuclear exchange between the Soviet and U.S. navies. That was the only time during those thirteen days that the president accepted such provocative and dangerous advice. immediately destroying a SAM site if a U-2 were shot down. The evidence from the missile crisis tapes does not fit into any simplistic ideological box. President Kennedy often stood virtually alone against warlike counsel from the ExComm, the JCS and the leaders of Congress during those historic thirteen days. Nonetheless, he never abandoned his commitment, even after the missile crisis, to undermine the Cuban revolution and get rid of Fidel Castro. It was one thing, however, to support efforts to eliminate the Cuban leader, and quite another to recklessly risk unleashing a global nuclear holocaust. Nonetheless, Chomsky’s assertion that JFK "took stunning risks to impose American hegemony" is an ideologically-driven fantasy refuted by the indisputable evidence on the ExComm tapes. ● Chomsky quotes my conclusion that on October 26, JFK was “leaning toward military action to eliminate the missiles.” What he does not do, of course, is explain the context of both that discussion and my conclusion: namely, the growing concern in the White House that work was continuing on the missile sites and the fear that they would be rushed to completion if negotiations stretched on for days or even weeks. ● Professor Chomsky also argues that JFK’s resistance to going to war was merely a “pragmatic stance” lacking in “moral considerations.” He never mentions Kennedy’s repeated warnings to the ExComm about the catastrophic implications of nuclear war and the fact that 80-100 million people would die in the U.S. alone. Kennedy argued persistently that nuclear weapons were militarily useless; no rational person would really use them, he told several members of the JCS on October 29, because it could so easily spiral out of control. ● Chomsky’s notion that the Kennedy administration insisted “that Khrushchev be seen to capitulate” is a half truth at best. He does not mention the fact that if the Soviets had turned down the secret missile trade, JFK was prepared, through a secretly pre-arranged plan initiated by the U.S. through the U.N. (the so-called Cordier ploy), to publicly accept the trade regardless of the domestic political risks if that was the price that had to be paid to avert nuclear war. Finally, it is ironic that Chomsky considers himself to be one of those who “have escaped sufficiently from the ideological shackles to pay some attention to the facts.” His facts are selective and decontextualized and used consistently to promote his own ideological agenda. In his whole essay, there is only one tangential reference to the existence of the Cold War. The Soviet Union and its allies were, of course, just as blinded by ideological dogma as those in West. And, Khrushchev was hardly an innocent bystander in this dangerous game of nuclear Russian roulette. History, alas, is often more gray than black and white; there is far more complexity in historical study than is dreamed of in Noam Chomsky’s ideology.